Just wanted to share that I recently was invited to take part in a roundtable series of essays on The Comics Journal's column, The Hooded Utilitarian, which is an outpost for comics critic Noah Berlatsky (and a slew of guest contributors) to talk seriously about comics. The roundtable was called "Komikusu: Selling Awesome Manga" and was focused around "indie manga"-- what it is, the challenges of finding a readership, and how to get more people turned onto the quirkier and underground titles out there. Kate Dacey of The Manga Critic. Brigid Alverson of lots of places, inlcuding Mangablog. Shaenon Garrity who writes at tcj.com. My contribution, "Indie is as indie does" meanders a lot and doesn't quite make its points very clearly, but I tried to tackle the history of manga released in the states and how it has been positioned via genre/publisher. And also the idea that a title being referred to as "indie" in the States often has little to do with how it was originally published/received in Japan. Or something? Give it a read and tell me what you think! I encourage you guys to check out the entire roundtable when you have some free time! 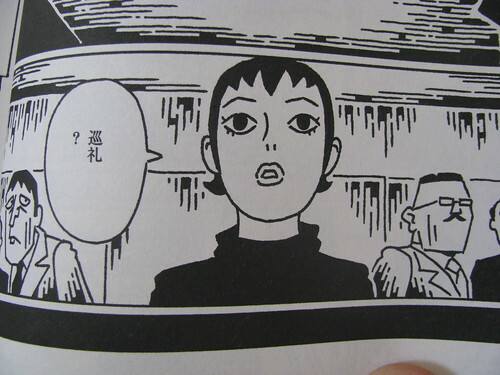 Osamu Tezuka: Wow that's so underground! Let's sell this only in adult section! What comic is that second picture from? I'm interested in that. Haha, never mind, I went to read your actual contribution and it was sited there . . .
Also, I actually (by the skin of my teeth) made it on that school Japan trip that I mentioned here a while back, I'm studying Japanese (for the first time) in a little Adventist (obscure Christian religion that my parents belong to) College in Otaki but we planning to spend the final week in Tokyo. I know there are a bunch of people here who can recommend their favorite comic stores in Tokyo and though I don't know how much freedom I'll have in Tokyo or how well I'll be able to communicate with shop keepers by then I was wondering if someone would give me a tip. I enjoyed the roundtable immensely. It was a fantastic read to hear everyone's take on the situation not to mention it made me reflect on how much manga has exploded in the US over the last ten years or so. @yukiko - Go to Nakano Broadway if you can. It's awesome. Check the Same Hat post from last year(?) for more info. AWESOME! Thanks for the tips Jim. A friend who has been said the same things about Nakano. I'm definitely going to do my best to drop by there. I also read the two entries from Samehat so thanks Ryan! How expensive are those old issues of Garo? I've been interested in it ever since I started being a regular here and seeing its name pop up so often but I really know nothing about it save for what I've heard here and what wikipedia could tell me (haha). Assuming they still have any of them, (I'm not sure how realistic that sounds, like I said I know nothing Garo) is there any specific issues people can recommend? @Yukiko: Have a great trip, dude! Any Mandarake will make you pretty happy, though I still say that Nakano is the best shopping in Tokyo for weirdo fans like us. Old issues of GARO (and Com, AX, etc) are actually not that expensive at all. I think I've mentioned in posts about the exhibit in New York, but you can easily get a lot of issues for $4 to 8 bucks. Some of the older/rarer issues are more, but they aren't really "collectors" items in that sense. If I was there and had some cash to spend, I'd pick up a few goodies/oldies, but also just check out new comics on the Featured table in Taco Che... it's a great way to get a sense of the contemporary "indie" manga scene!